Believe it or not a small village in the island of Anglesey in Wales is famous for having the longest place name in English Latin alphabet system in the World. 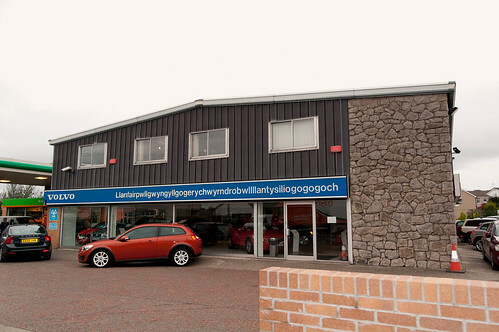 The name is - Llanfairpwllgwyngyllgogerychwyrndrobwllllantysiliogogogoch. As per Wikipedia there is a hill in North Island, New Zealand with 86 letters, however this Welsh village which contains 58 letters is the longest place name for a community. The name of the village translated in English means - St Mary's Church (Llanfair) in the hollow (pwll) of the white hazel (gwyngyll) near (goger) the rapid whirlpool (y chwyrndrobwll) and the church of St Tysilio (llantysilio) by the red cave ([a]g ogo goch). 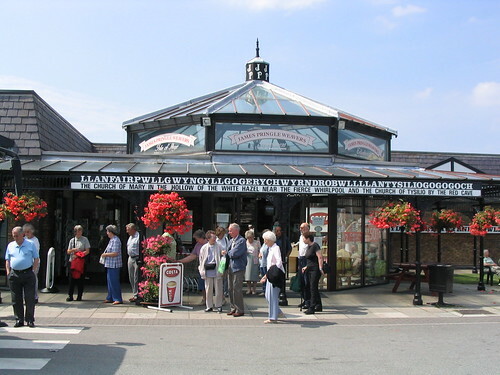 A sign on the railway platforms gives its English pronunciation as "lan-vire-pooll-guin-gill-go-ger-u-queern-drob-ooll-llandus-ilio-gogo-goch" which to most of the persons visiting the place is still unpronounceable. The village is therefore generally referred by its abbreviated names Llanfair PG or Llanfairpwll. The village is a big draw for tourist visiting the area and many of them pose for a photograph before the long name at the railway platform or outside the railway station. Many shops also proudly display the extra large name on their sign boards. Here few images of the buildings displaying the long name. lanfairpwllgwyngyllgogerychwyrndrobwllllantysiliogogogochuchaf.com which is also the longest valid domain name in the world. In order to create the record suffix 'uchaf' was added which means "upper" in Welsh and refers to upper (old) part of the village. I wonder, how the native people pronounce the whole name?! It isn't English - it's Welsh! Hi Simon - I had used the word English to convey the alphabet system and not the English language. In order to avoid confusion I have now changed it to "Latin alphabet system".